Mixers, dispersers, mills, pots and associated equipment for the surface coating industry. 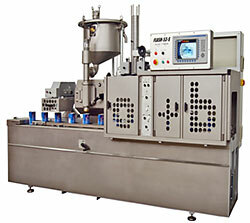 Processing, mixing, filling and packaging equipment for the food, pharmaceutical and other industries. More than 45 years manufacturing and developing machinery for the Paint and allied industries have allowed Oliver + Batlle S.A. to offer a wide range of high quality equipment and integral services to the market. Our design and manufacturing method encompasses 4 activities: Agitation, Grinding, Filling and Systems for all kind of products of médium and high viscosity. The study of projects involving production and filling lines including technical advice are included in our services. In OLIVER + BATLLE we provide guidance and adapt our technological knowledge to the requirements of our customers to offer products that perfectly conform to their expectancies. An innovative and always updated technology, a factory surface in excess of 24.000 m2 plus a staff of more than 150 qualified professionals have contributed to make OLIVER Y BATLLE one of the leading companies in the sector and to be present in the five continents.